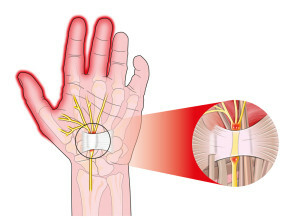 With carpal tunnel syndrome (=CTS) the median nerve gets caught in the carpal tunnel of the wrist, which produces typical neurological symptoms such as pain and numbness (thanks to www.eorthopod.com for this image) of thumb, index finger, middle finger and half of the ring finger (the half closer towards the thumb). Associated with this is a weakness in the wrist and an aggravation every time the wrist is bent repetitively or gripping is done frequently. 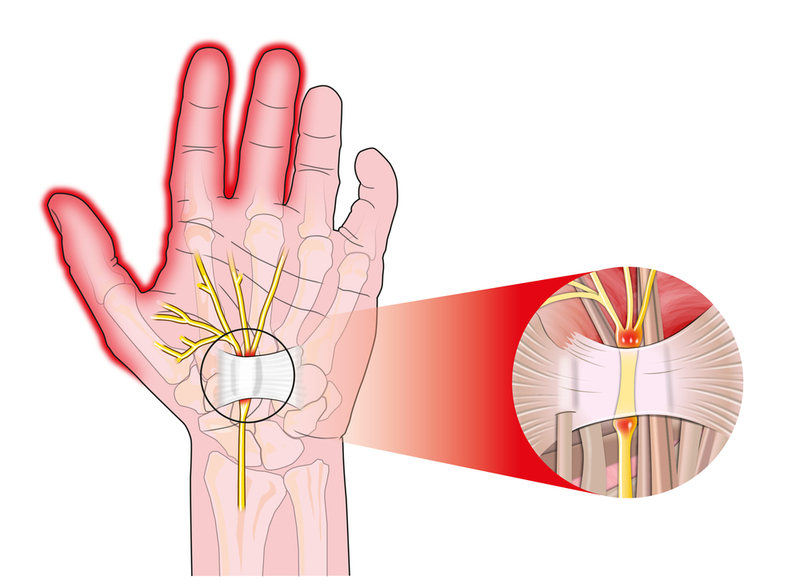 Electromyography in a neurology lab will document a slowing of the nerve impulses in the median nerve, but not in the other two arm nerves (ulnar and radial nerves). The neurosurgeon or hand surgeon will cut the carpal ligament to release the pressure in the flexor tendon compartment where the median nerve travels along with the tendons (carpal tunnel release surgery). This has been done in the past as an open procedure, but is now almost always done as an endoscopic procedure. The patient will recover within 2 to 3 weeks and can return to work after that time. Diseases such as diabetes or hypothyroidism are associated with a higher incidence of CTS on both sides of the wrist. 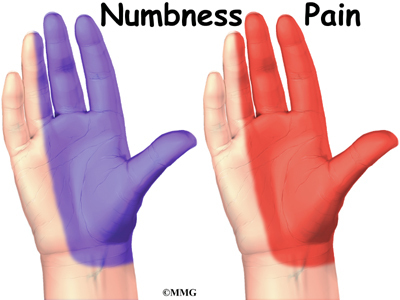 Work related CTS is usually occurring on the dominant working hand. There are also constitutional factors where in one family almost all members develop CTS on both hands, if not in early adulthood, then later in life. It is important not to ignore the symptoms as otherwise permanent muscle atrophy sets in and in these cases chronic regional pain syndromes with crippling pain can develop.